Rebounding in basketball isn't so much about jumping. It's about position. Knowing where the ball is going to end up landing. Being ready for the opportunity. Based on those qualifications, if my dog Schnoodle had played basketball, the old girl would have made the hall of fame. 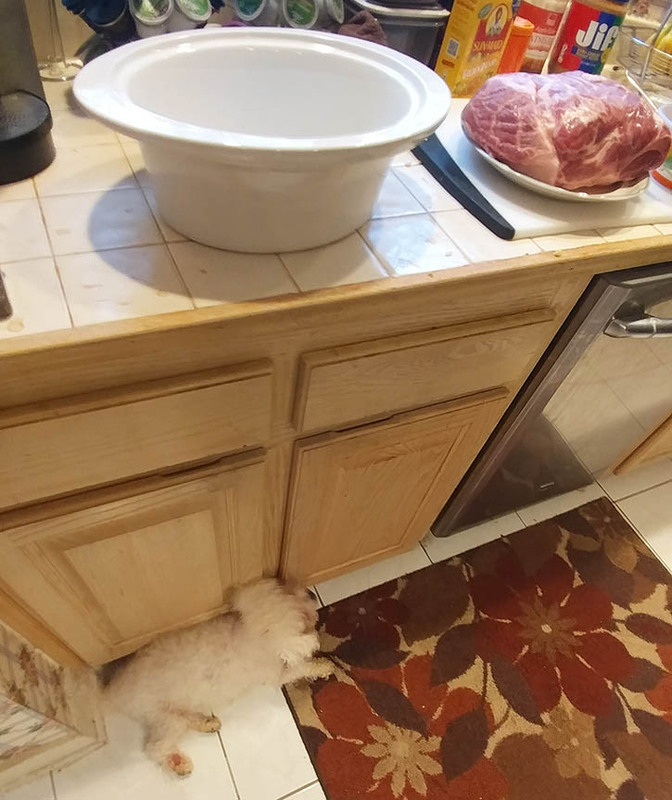 No dog can read the kitchen, come up with a plan, and be where the odds are best that a mistake will be made. She doesn't look for food scraps. Food scraps fall in front of her. She is the Dennis Rodman of kitchen canines. Today is a rainy day in Ashburn, and neither my wife nor daughter will eat leftovers (or even something twice in the same week). So since it is so dreary outside, I'm cleaning out the refrigerator and freezer of older foods coming up on an expiration date. I've turned three chicken breasts into chicken salad for sandwiches for the next few days; I have taken 1.5 pounds of ground beef and made it into a chili/taco meat mixture to go on hot dogs, baked potatoes or other assorted options over the weekend; yesterday I found this beautiful pork shoulder minding its own business in the back of the freezer. It has been appropriately bathed in a dry rub, had garlic inserted into it, and is peacefully resting until tomorrow. Making these three dishes so there's plenty to warm up and eat on a moment's notice over the weekend involved doing a lot of chopping and mixing in various places in the kitchen. Schnoodle moved when I moved and always found the right spot. Making this more amazing is she lost her sight several years ago. But that does not hinder the pooch, as she has a nose with abilities the CIA would envy. She's 15 years old and she unfortunately never got to play basketball. She could have been a contender. Instead, she roams the kitchen like a BOSS. And when it comes to kitchen scraps, she's the real MVP ???? Even though it’s the day after election day, here's something going on across the nation that I think is far more interesting. It’s the rankings for fattest state in America, the battle to see who consumes the most sugar, pork fat, gravies and otherwise delicious foods at meal time. It was compiled by Wallet Hub and you can see the full rankings here. The winner? Mississippi, come on down, as you have easily secured the top spot. The land of deep-fried catfish, barbecue, opossum and even more deep-fried catfish is No. 1. You're not fat, as they used to say, you're just big boned. You may be No. 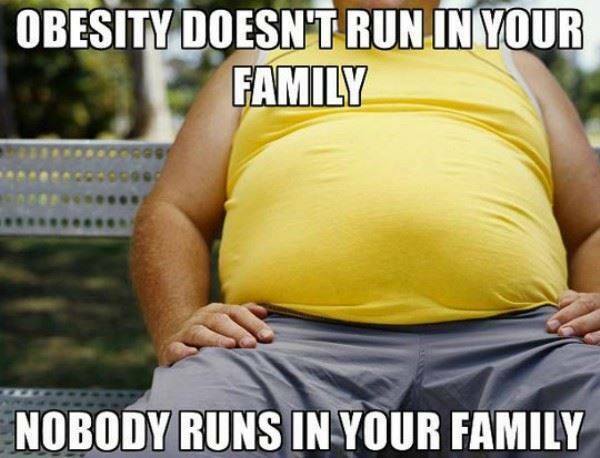 1, but obesity doesn't run in your family. Nobody runs in your family. You might look at that list of states at the top and notice a trend, and no, it’s not that they are all southern states (which they are). But I spent many decades as a sales and marketing road warrior travelling this great country, and while in those states I noticed a couple of similar situations. For one, you won’t meet a lot of people in those states who eat kale or arugula. That’s not to say they don’t exist, but when you meet one, there’s usually a term for them: “Health nut” or “Yankee” top the list. This morning, I was working on the details of a focus group I will be involved in later today, where I will work with an organization to help determine what their brand really is, what they believe differentiates themselves in the market, and what they think people really value them for. As is usually the case, I jotted down a few stories to illustrate what we will try to accomplish, and for most marketing people, the story of Kodak usually makes an appearance. That iconic company was known by everyone because of their success in the area of film and cameras, and they actually invented the first digital camera in 1975. Thanks to that invention, we now carry and capture all of our favorite memories on something as small as our phones. But Kodak eventually went bankrupt in 2012. They thought their unique ability in the marketplace was making film and cameras instead of capturing all those memories. Others (like people who build phones) did see that, and developed products that made most of what Kodak was selling obsolete. The story immediately reminded me of what’s going on in sports these days. 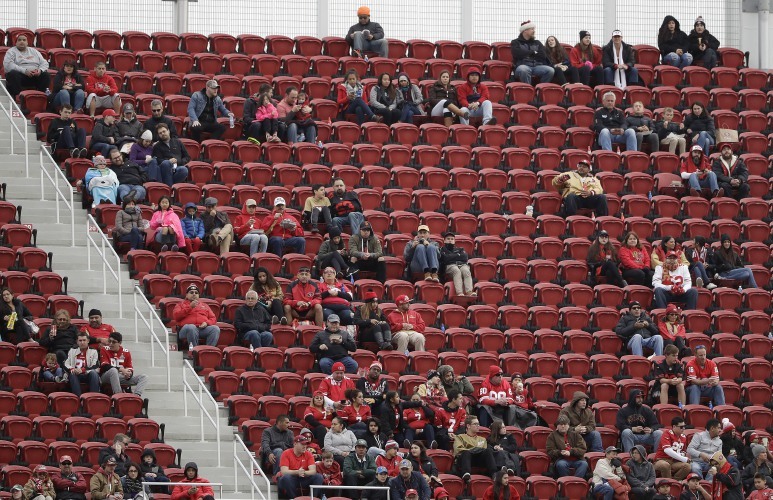 Turn on a television and you will see more and more fans dressed up as empty seats. Whether it’s college football, pro football, auto racing, etc., Athletic Directors and Team owners – to use a bad pun – are not getting the picture. Just one month ago, I returned to my alma mater at Virginia Tech to see a football game between the Hokies and Notre Dame, the first time I've done that in three years. Even though the Hokies lost, it was a fantastic time. It was a chance to see dozens of old friends, experience the electricity of "Enter Sandman" as the team made its way into the stadium, tailgate with some great people, etc. The experience - and the related memories - were what made it great. It’s the day after another bad Virginia Tech loss. You’d think by now, I’d be getting really good at handling this sort of situation. But yesterday’s loss really bothers me. This one showed me something I guess I’ve sort of known in the back of my mind, but the maroon and orange parts of my brain kept keeping it from rising to the surface. I can’t ignore it any more. It all centers around the state of the team in the third quarter of yesterday's game for the Hokies against Boston College. Virginia Tech played the first half with emotion, aggressiveness and momentum, and each good play seemed to feed that and create another good play. The team was confident, and they seemed to be having fun. From the time they left the locker room at halftime, however, all of those elements were gone, specifically on offense. That's when the game for all intents and purposes was lost. I'm not a guy who calls for people to be fired, as I don't know what was really called, what an athlete didn't execute, or what a quarterback did or didn't see when a play didn't work. I tend to judge those kinds of conversations as none of my business. 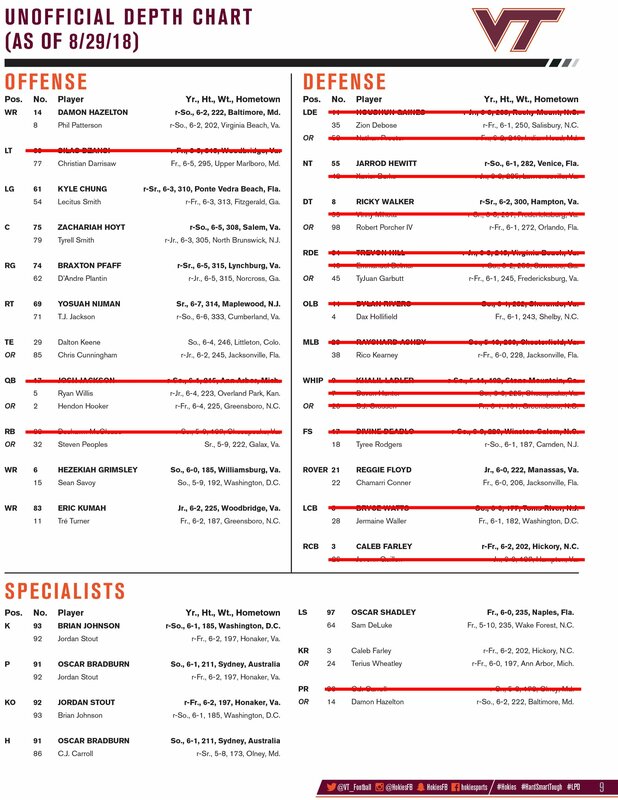 It’s the morning after Georgia Tech’s romp through Blacksburg, and it seems like most Hokie fans are feeling like the Virginia Tech defensive line played last night. 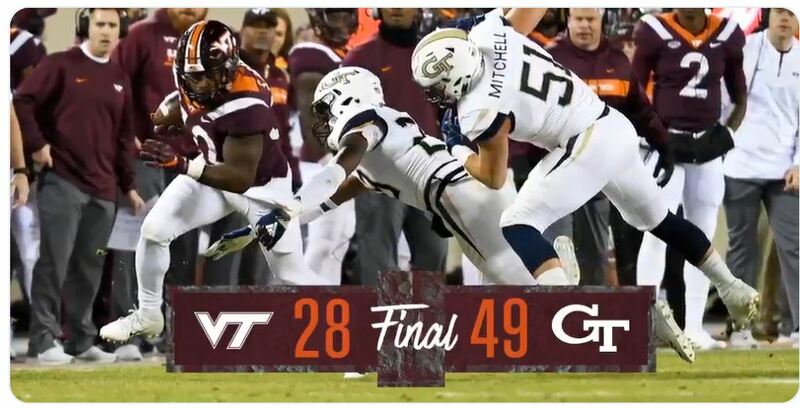 That Georgia Tech would win the game was not a huge surprise to those who have followed Virginia Tech for any length of time. That they would treat the Hokie defense the same way Alabama did back in 1973 when the Crimson Tide won 77-6 WAS a big shock. This was like watching a high school game where one team was clearly superior to the other. One team just lined up and ran the same 5 or 6 plays over and over again, as if to tell their opponent “here it is, try to stop it.” Virginia Tech couldn’t. It was so dominating, Georgia Tech didn’t complete a single pass and still put up 49 points. They only attempted one pass, as their running game was so dominant, they didn’t need to throw it. It’s not like they didn’t know what was coming, either. Georgia Tech’s old-school triple option offense has bedeviled the Hokies for years. Over the last four years, the Yellow Jackets have lost 23 games, so there are teams out there who have figured out how to deal with it. But to Virginia Tech, it has been kryptonite. Last night may have been the worst of the performances. I normally stay out of the whole "fake news" debate. If a story doesn't seem all that accurate, I just leave it alone and let others offer a counter opinion. But I had to draw a line on this one. As you can see, Darren Rovell is reporting from London, where the NFL was playing its annual game this morning. 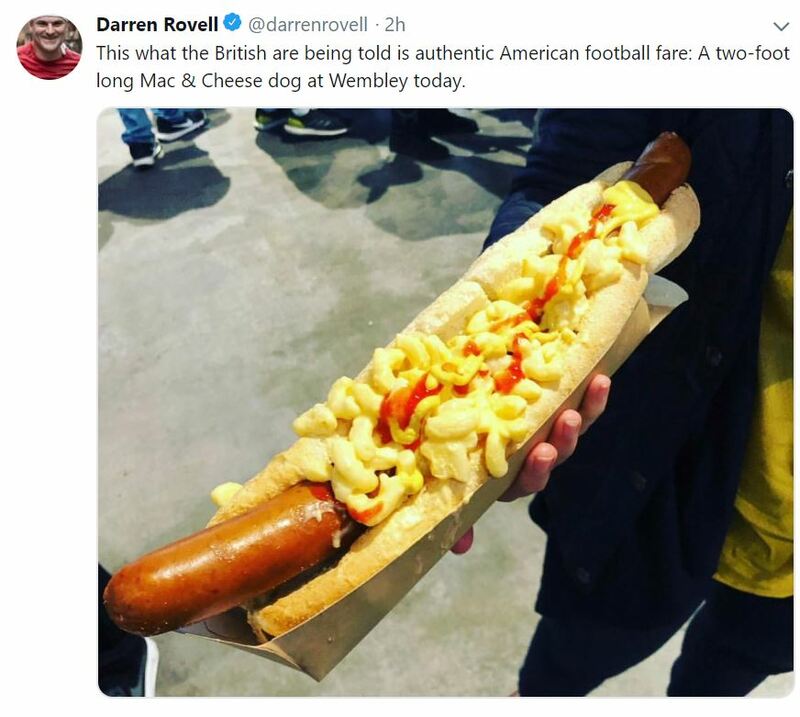 He says the the above picture is what the British are being told is authentic football fare: A two-foot long Mac & Cheese dog at Wembley Stadium today. This, of course, is patently untrue. I don't know ANYONE who would put ketchup on macaroni & cheese ???? Today the Washington Redskins play the Dallas Cowboys. Commercials are hyping the game as if it's a really big deal. CBS has moved the game to the 4:25 window so most of the nation can see it. I’ve heard Dan Snyder is manipulating the ticket availability so he can squeeze one more drop of blood from every stone called a “Washington Redskins Fan.” TV and radio are playing clips from years past to remind everyone how intense the rivalry has been, and how important the game should be. Only problem is, it’s not. I mean, it certainly was at one time. George Allen hated the Cowboys and circled the dates of the games on the calendar every season. Year after year, all of us got tired of just missing the playoffs because the Redskins couldn’t figure out how to get around those guys with the Big Blue Star. Joe Gibbs planned for months in the offseason how to beat "America's Team." But that was a long, long time ago. The clip that plays the most when the wizards of television take us back in time on these nostalgic journeys is the one involving the fans at RFK, bouncing up and down, going crazy, and chanting “We Want Dallas.” That was in 1982. 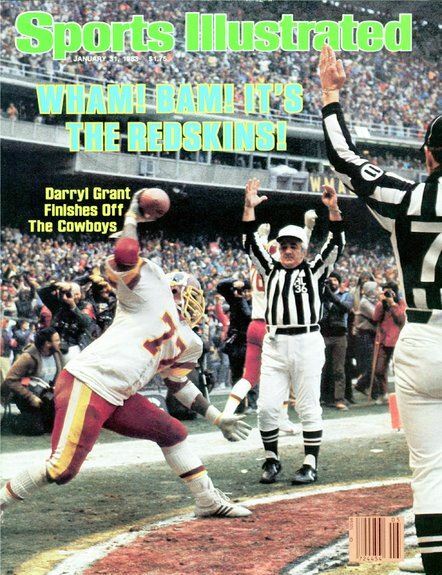 The days of Roger Staubach breaking our hearts, Clint Longley ruining our Thanksgiving dinner, Daryl Grant creating what felt like an earthquake at RFK when the crowd exploded as he intercepted a tipped pass by Gary Hogeboom and returned it for a touchdown…those all happened in the same time frame or earlier. 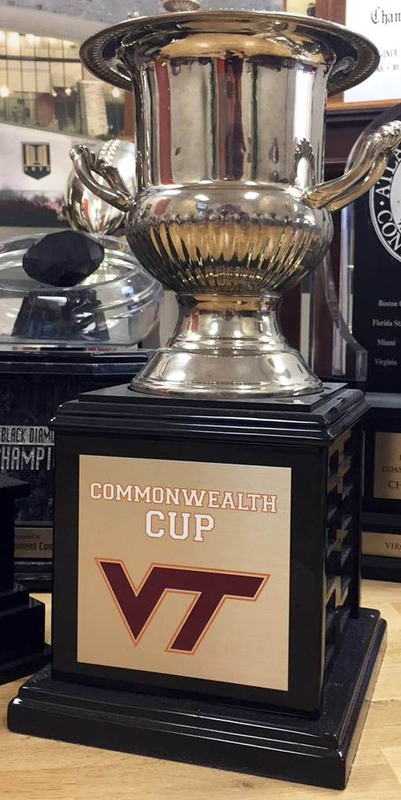 I have been warning my Virginia Tech friends that they need to watch out for Virginia, because this year they have a good quarterback in Bryce Perkins, a fast receiver in Olamide Zaccheaus and a couple of good defensive backs in Juan Thornhill and Joey Blount. But secondary to that is what I’m seeing every week. The team in Charlottesville is buying into what Coach Bronco Mendenhall is selling, and with each win, their confidence is growing. Last week it was No. 16 Miami. Today it was Duke in Durham. I’m not sure how much credit to give for the win because the Blue Devils could arguably be the worst 5-1 team to walk this earth. Pro scouts seem to like quarterback Daniel Jones, but all he showed today is that he has a strong arm that allows him to throw interceptions into double coverage much farther down the field. Duke’s offensive line didn’t help him any either, as they protected their quarterback the way I exercise: Not very well and not very often. That’s not going to happen this year. They have some balance. They believe. And no matter what the most hard-core of Hokies wants to believe, they have a good football team. They do have weaknesses. The biggest has been in the kicking game, but they seem to have found one in Brian Delaney. He was their kickoff man until last week, when they used him as the placekicker against Miami. He responded with three field goals, including a 46-yarder, and the Chantilly kicker was the toast of the media circuit this week because of it.